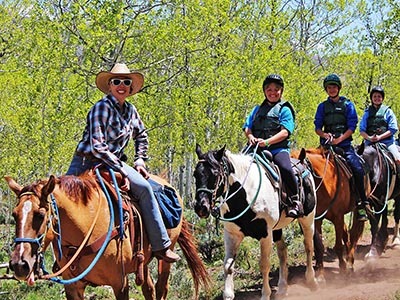 The horseback riding activity is assigned to groups on a rotation schedule for 18 riders per time slot. Guests still need to sign-up at the Trading Post and check in at the corral 10 minutes prior to ride time. Riders must sign the appropriate waiver of claims form, must wear vests and helmets while riding, and follow all posted rules and instructions given by the staff wranglers. Riders must be 10 years of age or older. Cancellation of Trail Rides may occur due to inclement weather. Pony rides are available for guests ages 3-9. Reid Ranch employees lead the ponies. Many guests have asked for longer trail rides; so we now also offer Evening Horseback Excursions for an additional fee.